It’s been nearly three years since I posted a summary of the current state of cyberbullying research on this blog. That post was inspired by my concern that no researchers were included on a panel that testified to the Committee on Education and Labor’s Subcommittee on Healthy Families and Communities on the topic of how teens were using and misusing technology. I was troubled then, and remain concerned that quality research about cyberbullying has not been making it into mainstream discussions in the media, even though research in this area has flourished. I want to take a moment to update readers on what we know about cyberbullying based on our research – and that of others who have been exploring this problem. Over the last decade, Sameer and I have surveyed more than 20,000 middle and high school students in twelve different studies from over 80 different schools throughout the United States. The first two studies were online exploratory samples used to obtain a general understanding of the problem, so the numbers obtained are higher than average and not representative because they only include online teens who volunteered to participate. Our seven most recent studies, however, have all been random samples of known populations in schools so we can be fairly confident in the reliability and validity of the data obtained (click here for more information about the methodology). Overall, about 28% of the students we have surveyed over the last ten studies have told us that they have been cyberbullied at some point in their lifetimes. About 8% said they were cyberbullied in the 30 days preceding the survey. Similarly, about 16% of those who we surveyed admitted that they had cyberbullied others at some point in their lifetimes (about 6% in the most recent 30 days). 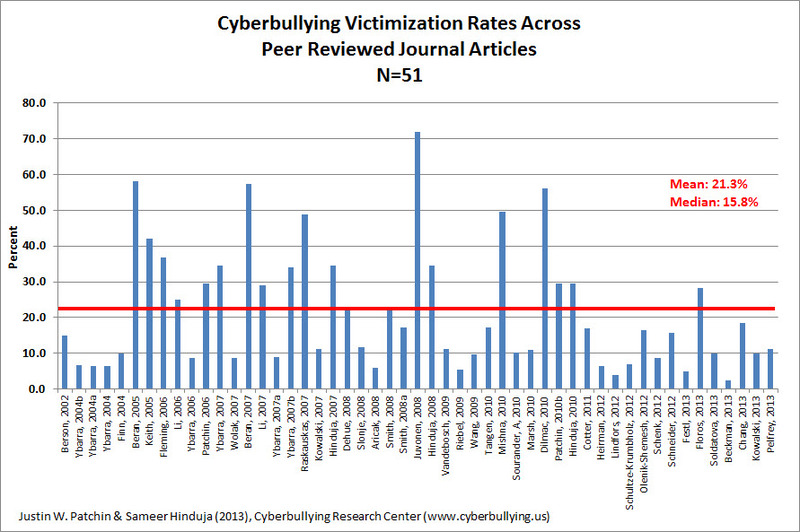 This past summer, Sameer and I (along with one of my undergraduate students) reviewed all of the published research we could find that included prevalence rates for cyberbullying. This work built on our earlier effort to quantitatively summarize published cyberbullying articles which we wrote about in our book Cyberbullying Prevention and Response: Expert Perspectives (see especially chapter 2). In total, we have now reviewed 73 articles published in peer-reviewed academic journals. Fifty-one of those included cyberbullying victimization rates and 42 included cyberbullying offending rates. As you can see from the charts below (click to enlarge), rates across all of the studies ranged widely, from 2.3% to 72% for victimization and from 1.2% to 44.1% for offending. The average across all of these studies was remarkably similar to the rates that we found in our work (about 21% of teens have been cyberbullied and about 15% admitted to cyberbullying others at some point in their lifetimes). Taken as a whole, it seems safe to conclude that about one out of every four teens has experienced cyberbullying, and about one out of every six teens has done it to others. There are only two studies that we are aware of that have explored cyberbullying experiences over time. The first analysis was conducted by our friends at the Crimes Against Children Research Center at the University of New Hampshire. Examining the three waves of the Youth Internet Safety Survey (2000, 2005, 2010), they find a slight increase in cyberbullying behaviors over that time period (from 6% to 9% to 11%). The second data source is the School Crime Supplement of the National Crime Victimization Survey (NCVS). In 2011, 9% of students said they were cyberbullied compared to 6.2% in 2009. Since the NCVS data are weighted to represent the entire population of 12-18 year-olds enrolled in grades 6 through 12, we can estimate that about 2.2 million students experienced cyberbullying in 2011, up from about 1.5 million in 2009. Overall, even though we don’t have a lot of good research to go on, it seems reasonable to presume a slight increase in cyberbullying behaviors over the last few years. I should acknowledge, however, that a recent poll from MTV and the AP released last month seemed to suggest a decrease in cyberbullying behaviors. 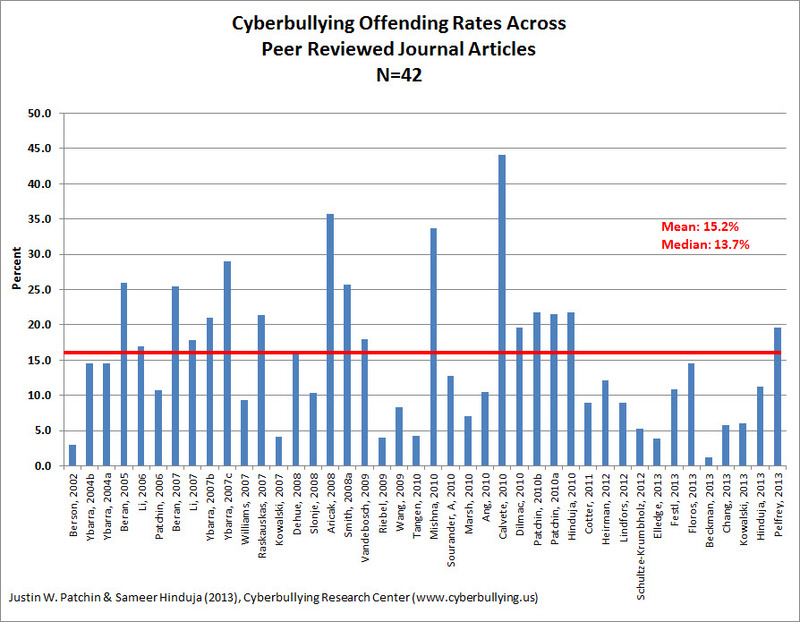 I haven’t been able to examine the full methodology of that poll so it is difficult to know exactly what is going on, but I am suspicious since the numbers reported overall (49% cyberbullied in 2013 compared to 56% in 2011) are significantly higher than those in the peer-reviewed published literature that I summarized above. We have come a long way in a relatively short amount of time, but more research is still necessary. Public attention to the problem of cyberbullying is at an all-time high. As such, good research is necessary to contribute evidence-based insight into the nature of this problem and its possible solutions. Cyberbullying scholarship must continue to advance by improving methodological standards, including the use of validated measures, representative samples, and, where possible, longitudinal data. Supplementing quantitative findings with those from thoughtful and comprehensive qualitative inquiries will also help to better understand the precise nature of some of these relationships. With these considerations in mind, research will be better able to inform the public conversation about cyberbullying in a way that equips educators, parents, policy makers, and others with the information they need to make a positive difference in the lives of adolescents, online and offline. Is there any way to stop harassment on a website that doesn’t follow it’s own T.O.S. and allows cyberbullying of members? I would imagine this has to do with the culture of the moderators. The moderators would either enforce the terms of service or the terms of service would reflect the environment that the moderators allow. Yes. Stop going on it. Problem solved. Hi, im doing a research about cyberbullying and believe that girls cyberbully more than boys. In a few summary’s you write that girls cyberbully more (also it is shown in one of your tables), but i cant find it in your scientifcal articles. Can u tell me in which scientific articles u proved this? Thank u very much! Dear regards, Laurens. Unbelievable! I had no idea that the statistics were so high! I agree that we do need to hear more about cyber-bullying in the media.